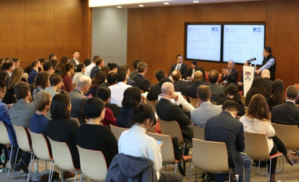 A PWCC panel of Chinese and American business and nonprofit leaders shared their expertise on how international cooperation and data collection have helped to improve air quality. Earlier this year, China released its 2020 action plan for tackling air pollution and improving air quality over the next three years. It’s a major priority for the country and the world in general. 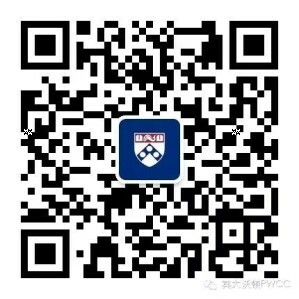 At Penn Wharton China Center in the Chinese capital, leaders from the U.S. and China met on October 15 to discuss changes in air pollution and environmental protection. The event, supported by the Environmental Defense Fund and PWCC, marked the 10th anniversary of the air quality monitoring program implemented by the U.S. Embassy in Beijing. U.S. 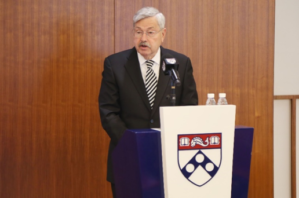 Ambassador to China Terry Branstad delivered opening remarks. This program began efforts to track and publish data related to air pollution in China. Ambassador Branstad said such initiatives have delivered remarkable, life-saving results. “Beijing’s air monitoring network is one of the most advanced in the world. The air quality has measurably improved — by nearly 80 percent over the past 10 years. Amazingly, last year was the cleanest year on record in Beijing since we began air monitoring,” said Branstad. The Ambassador attributed part of Beijing’s improvement in air quality to U.S.-China collaborations in enhancing air quality monitoring and regulations. Such collaborations include joint efforts between Mr. Dale Evarts, former Director of the Climate and International Cooperation Group at the U.S. Environmental Protection Agency, and Ms. Ming Dengli, Director of Science and Technology and International Cooperation at the Beijing Environmental Protection Bureau. U.S. 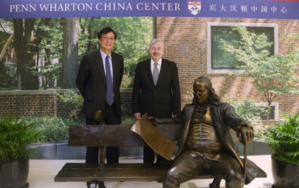 Ambassador to China Terry Branstad delivered opening remarks at the event. 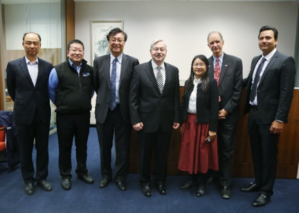 Mr. Evarts and Ms. Ming have been working together for around 17 years to address air pollution in both China and the U.S. and PWCC was happy to welcome them as speakers on the panel. They shared insight into their work, China’s efforts to tackle air pollution since 1998, and useful lessons other countries and cities can learn from China and America. The panel also included business and nonprofit leaders from both China and the U.S. Mr. Ma Jun, Director of the Institute of Public and Environmental Affairs (a Beijing-based nonprofit environmental research organization) stressed the importance of collecting air pollutant data to enhance communal wellness. He also emphasized the need to engage the public in such efforts. Mr. Peter Pomponi, Vice President of Oregon-based Met One Instruments, represented the technology sector on the panel. Met One Instruments produces air monitoring equipment for the U.S. Embassy and various Chinese organizations and agencies, too. Mr. Pomponi lauded China-U.S. collaborations to improve air quality. Mr. Zhang Jianyu, Director of the Environmental Defense Fund, facilitated the panel discussion. Also speaking at the event, Dr. Gary Hua, Managing Director of the PWCC, highlighted the important role that U.S.-China exchanges play in education and research on air quality control and how PWCC is happy to support these efforts.